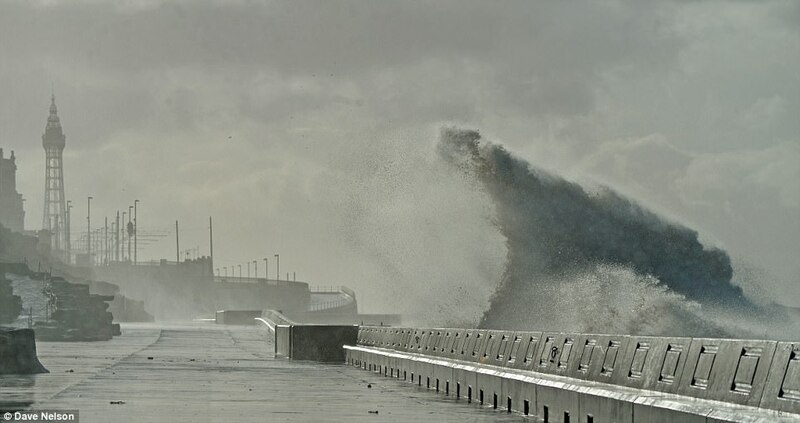 Britain was battered by gales gusting to 95mph overnight that downed trees and damaged buildings - but the Met Office insisted the winds were not severe enough to warrant being named as an official winter storm. Forecasters sparked confusion by saying the weather system had not been named because it happened at night and therefore had a lower impact on the country. 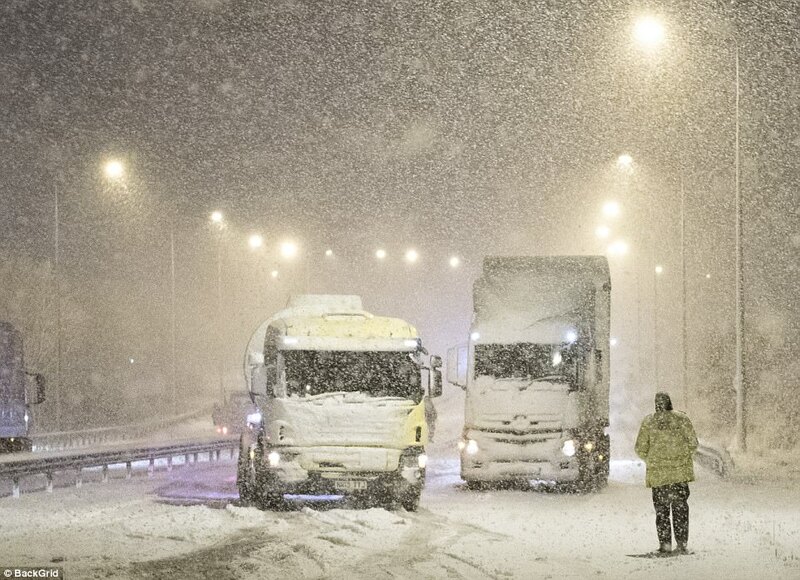 Motorists were faced with disruption in the north with 'persistent and heavy snow' causing standstills on major roads at rush hour after a weather warning was upgraded to severe. Storm-force gales of 93mph were recorded at Capel Curig Saws in Wales today, while gusts reached 72mph at London City Airport and Liverpool this morning. 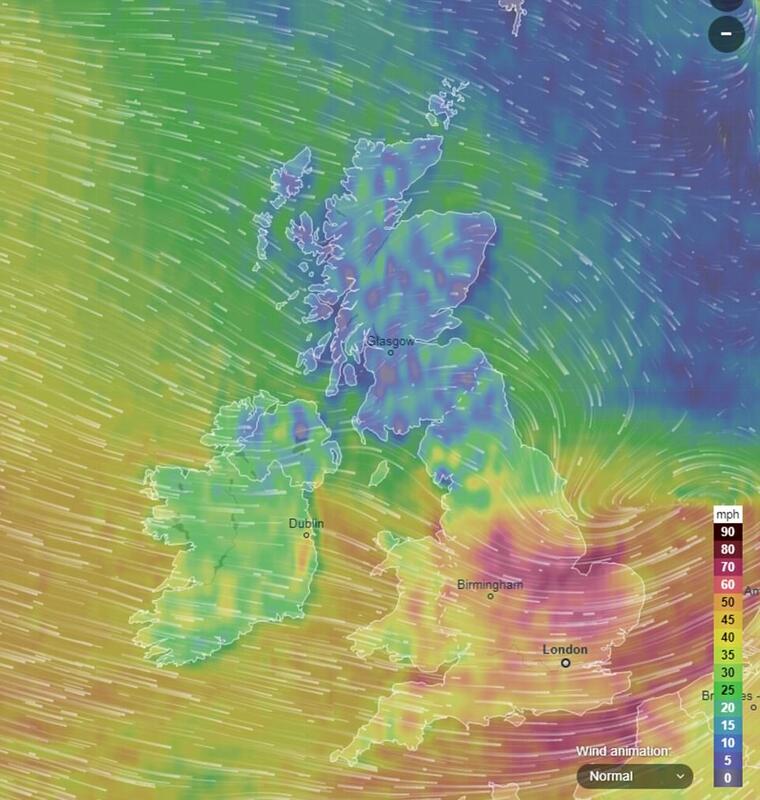 The extreme weather Britain is experiencing today is not directly caused by Storm Fionn, which has now passed and is making its way across to the rest of western and northern Europe. 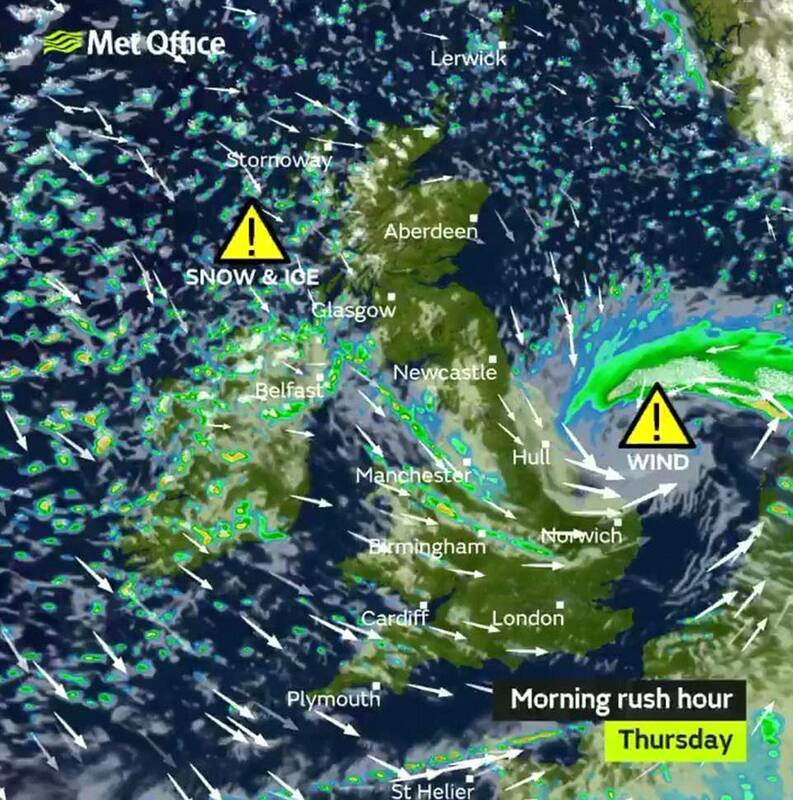 The remnants of Storm Fionn is creating low pressure across the UK, bringing severe gales of up to 95mph and heavy snow in the north. Today's weather bomb has not been named, after just falling below the criteria needed for a named storm. In France, where it is affecting the north of the country, it has been called Storm David and in The Netherlands and Germany it's been called Friederike. The next one in the UK is due to be called Storm Georgina, but the Met Office insist there is no sign of that in the next few days. 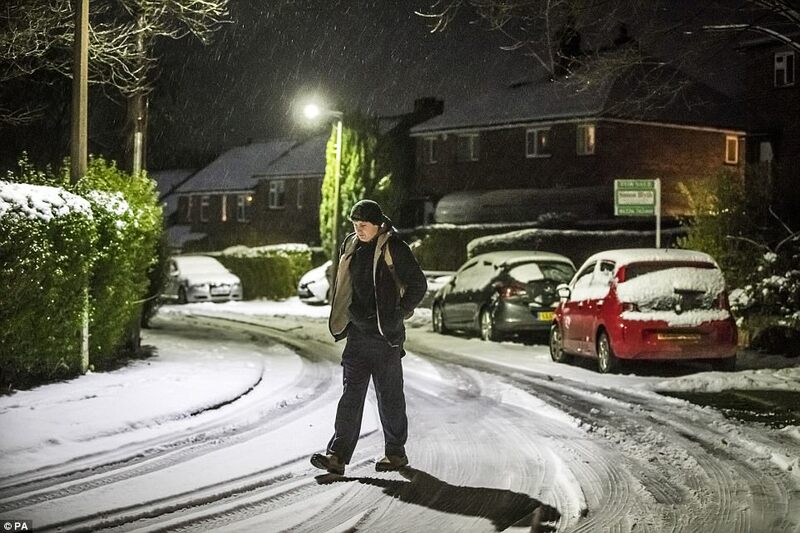 Met Office forecaster Oli Claydon told MailOnline: 'In the UK we assess the the impact of disruption on the roads, railways and things like that, before naming a storm. 'This can often be determined by the time of day and how much it is likely to affect people. In Ireland, however, it is measured by wind speeds or volume of rain, snow. 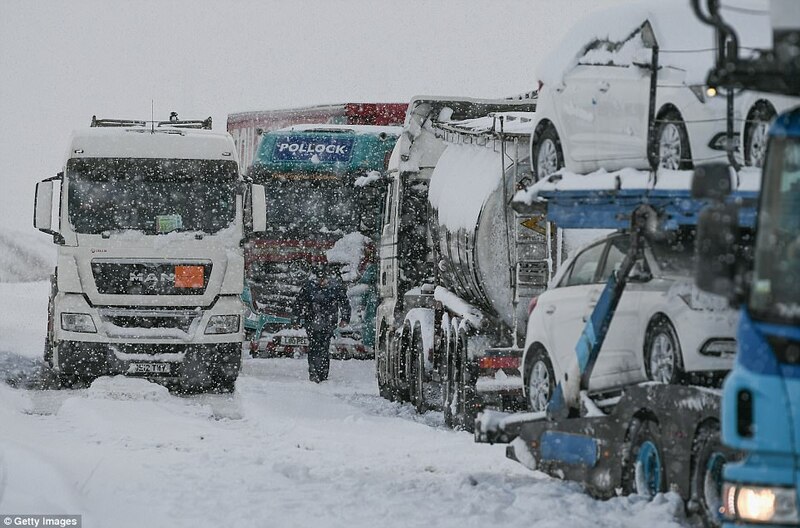 At least 30 vehicles were stuck on the A19 northbound, near Hartlepool, as heavy snow showers hit the region. Police arrived at the scene but there was no sign on any movement for a while due to snow ploughs being unable to get through. 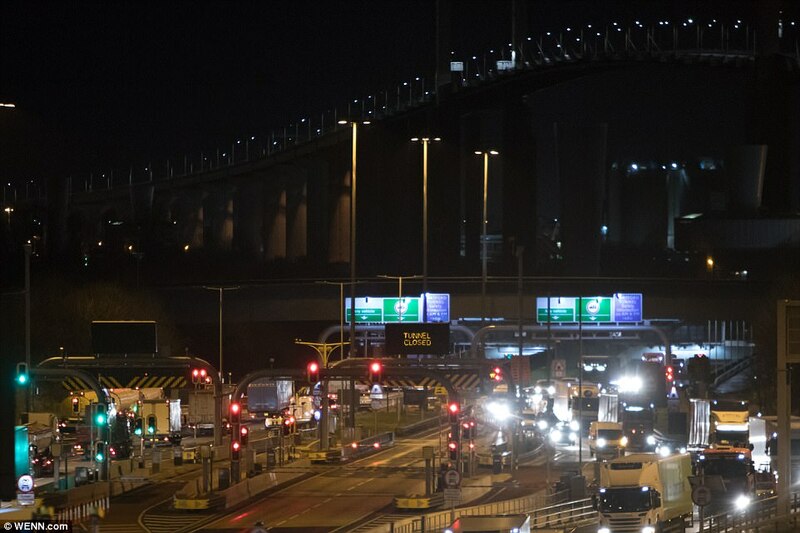 The Dartford River crossing was closed this morning due to the strong winds. causing traffic chaos on the M25, A2 and A13. The roof of a three-storey townhouse has blown off in Coventry overnight. No injuries have been reported from the incident. 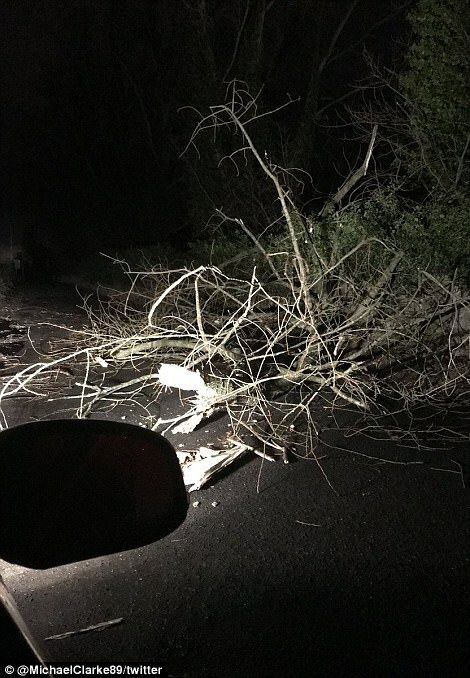 Pictures of fallen trees blocking roads, emerged from across the country, including in Newport and Leicester. 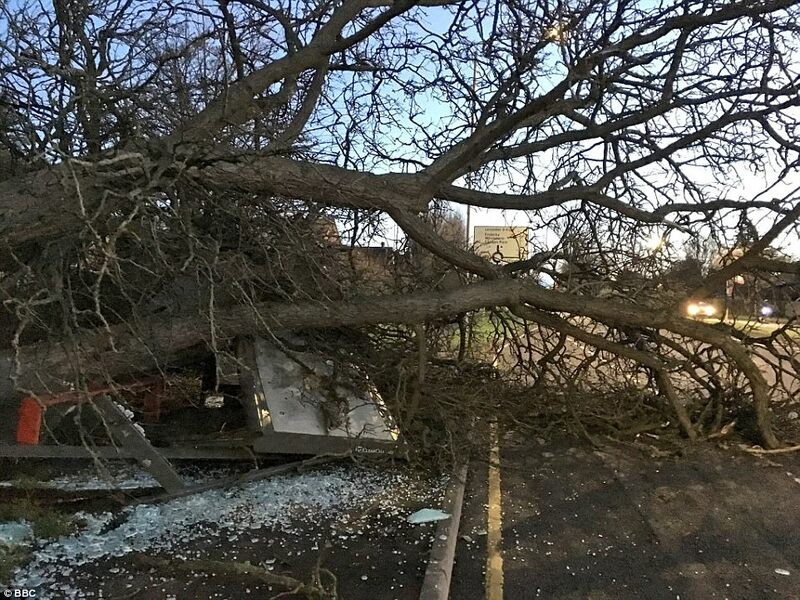 National Rail reported widespread weather-related delays, including disruption caused by a train hitting a tree near Lower Sydenham in south-east London, and another service colliding with a fence on the line near Sheerness-on-Sea in Kent. All Southern Rail services into London have been affected by weather incidents. Southern tickets are being accepted on London buses between Uckfield and Lewes - Tunbridge Wells, on Southeastern services between Tunbridge Wells and London, and on Southern services via Haywards Heath. Passengers were warned of delays and cancellations across routes in areas including Weymouth, Bournemouth, Southampton, Portsmouth, Guildford and London Waterloo. The problem also damaged signalling equipment at Milford, Surrey, blocking lines, and power supply equipment at Hinchley Wood. A tree also fell onto the line in the Deal area of Kent, while a freight train struck two sheds that had blown on to the railway between Newtown and Welshpool in Wales. In a series of tweets outlining the problems, National Rail said level crossing barriers between Chester and Wrexham had been damaged by high winds, with replacement road transport running between Chester and Shrewsbury. Flights between London City Airport and Amsterdam and Frankfurt have been cancelled, as the continent was also affected by bad weather conditions. UK Power Networks said more than 5,000 customers were affected by power cuts in the Geat Yarmouth area with hundreds more homes impacted across the east of England. Emergency services across the country received calls about weather-related incidents. West Midlands Fire Service said no one was injured when a brick gable was blown off a house in the Stoke Heath area of Coventry. Pictures posted on Twitter by crews at the city's Foleshill fire station showed debris on the ground near the three-storey property. 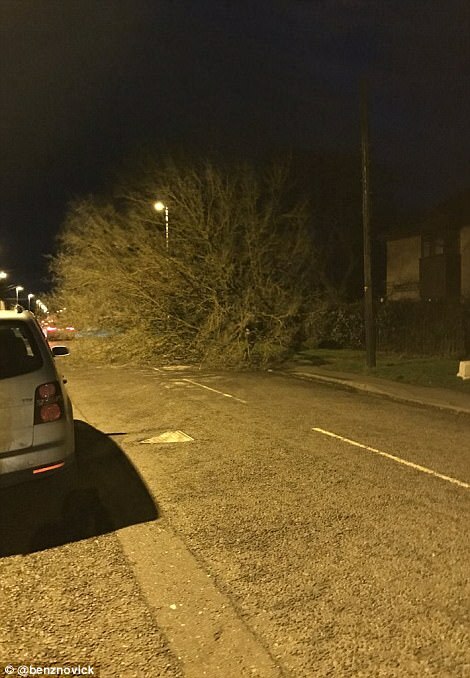 Derbyshire Police received a large number of calls regarding fallen trees blocking roads. During the night, temperatures dropped at low as minus 7C (19F) in Loch Glascarnoch while snowfalls continued to be topped up. Eskdalemuir in Dumfries and Galloway recorded 36cm of lying snow, while Spadeadam in Cumbria, which escaped much of the snow on Wednesday, had 23cm, with up to 20cm on Wednesday night alone. The Met Office amber weather warning of snow and ice ended at 5am and Police Scotland have downgraded their advice to 'high risk'. 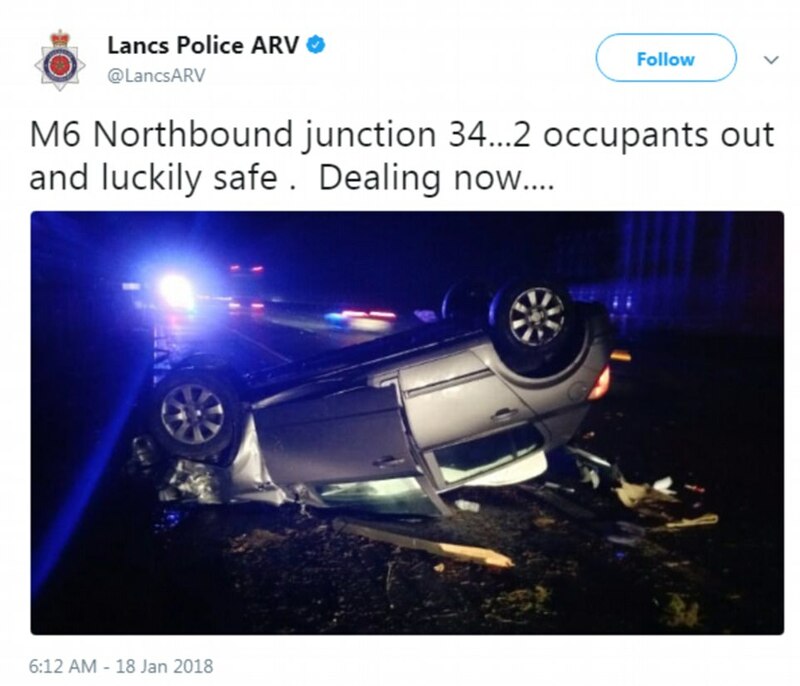 They said there is a high likelihood of disruption and delays on the roads. Superintendent Calum Glenny said: 'Despite some difficult weather conditions in the Dumfries and Galloway area which caused some disruption, the weather was not as severe as was first forecast. 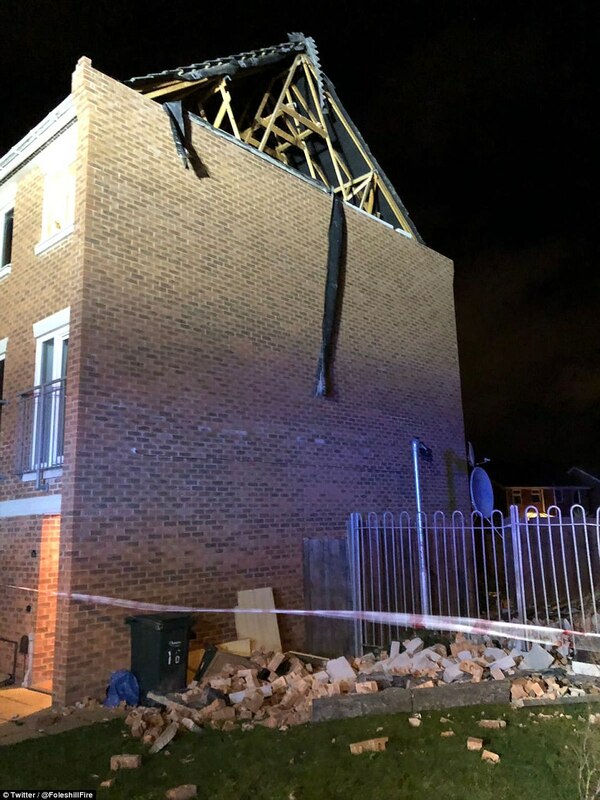 A three-storey town house was left with its roof torn off after being battered by the fierce winds of Storm Fionn. Dramatic images show a pile of bricks lying at the bottom of the £145,000 property in Stoke Heath, Coventry after the gable end fell off in 70mph gusts. Fire crews were called to the house in Burroughs Close at around 5.15am. It's believed that the family who live inside the property were asleep at the time but suffered no injuries. Police officers remained at the scene this morning to secure the area. Mowa Errabou, 21, was inside the property when the incident happened, and said: 'Our first thought was that it's going to keep collapsing. 'We heard strong winds throughout the night but we didn't think it would go this far. We kept hearing a few garden gates shut hard, but we weren't expecting that. 'When we came outside we just saw the damage and thought, 'wow, thank god it happened at night time'. 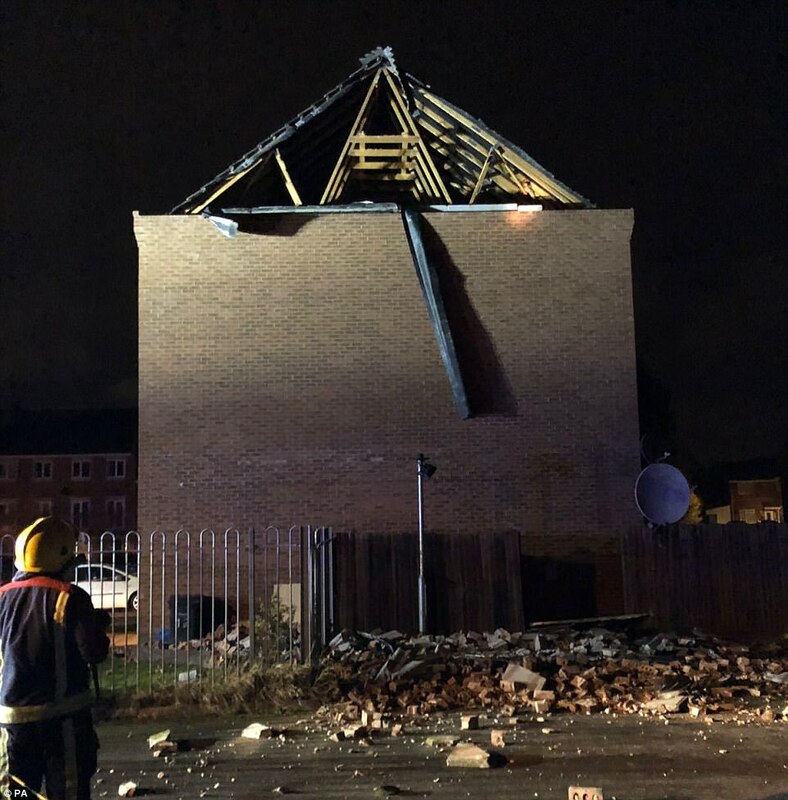 Tweeting the image, Foleshill Fire Station said: 'Red Watch Foleshill securing area around 3 storey town house, entire gable end which has blow [sic] off in Stoke Heath, Coventry. Meanwhile, damage to overhead power cables blocked lines between Colchester and Ipswich, and Birmingham and Redditch. Poor weather conditions also delayed journeys to and from London's King's Cross station after an object was caught in the overhead electric wires between Peterborough and Stevenage. 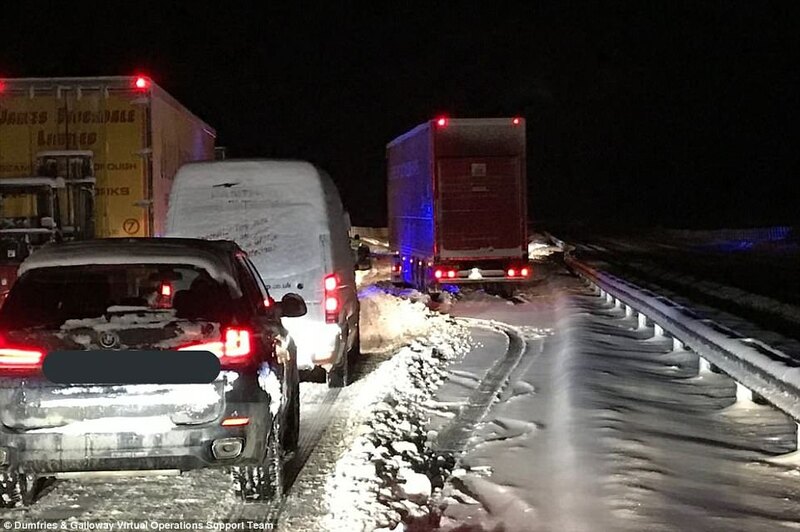 It comes after mountain rescue teams were drafted in to check on drivers stuck in their vehicles overnight yesterday when snow and ice brought the M74 in Lanarkshire, Scotland, to a standstill. Up to 15in (39cm) of the white stuff hit Dumfries and Galloway as heavy snow showers struck the country - and a further 8in is expected in some parts today. Forecasters have issued a fresh amber 'be prepared' warning of heavy snow for southern Scotland and northern England today, with disruption and cancellations expected to rail and air travel. The extreme weather Britain is experiencing today is not Storm Fionn, which is making its way across the North Sea to Europe. The remnants of the storm is creating low pressure across the UK, bringing severe gales of up to 95mph and heavy snow in the north. The next one is due to be called Storm Georgina in the UK. Before it is named, the combination of both the impact the weather may have, and the likelihood of those impacts occurring, is measured. Other weather types will also be considered, specifically rain if its impact could lead to flooding as advised by the Environment Agency, SEPA (Scotland) and Natural Resources Wales flood warnings. Therefore 'storms systems' could be named on the basis of impacts from the wind but also include the impacts of rain and snow. 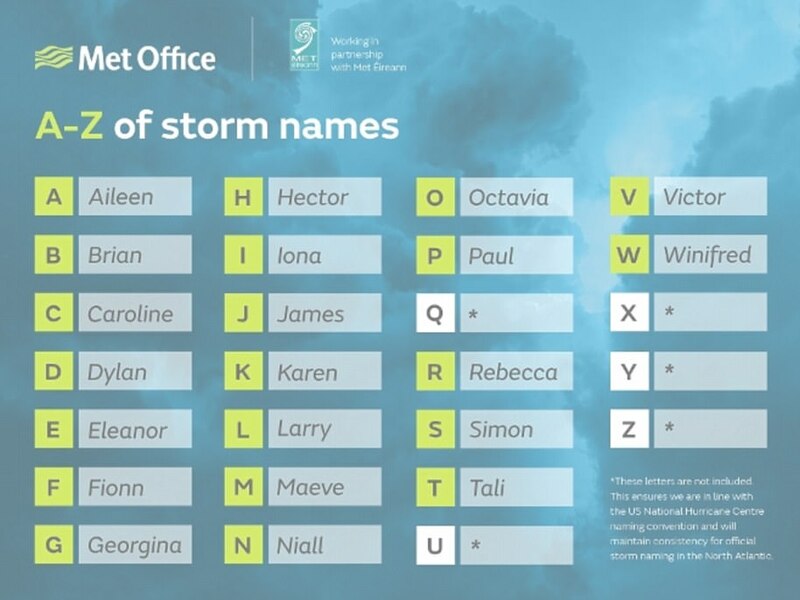 When the criteria for naming a storm are met, either the Met Office or Met Éireann (Ireland) can name a storm. 'This can often be determined by the time of day and how much it is likely to affect people. 'In Ireland, however, it is measured by wind speeds or volume of rain, snow. 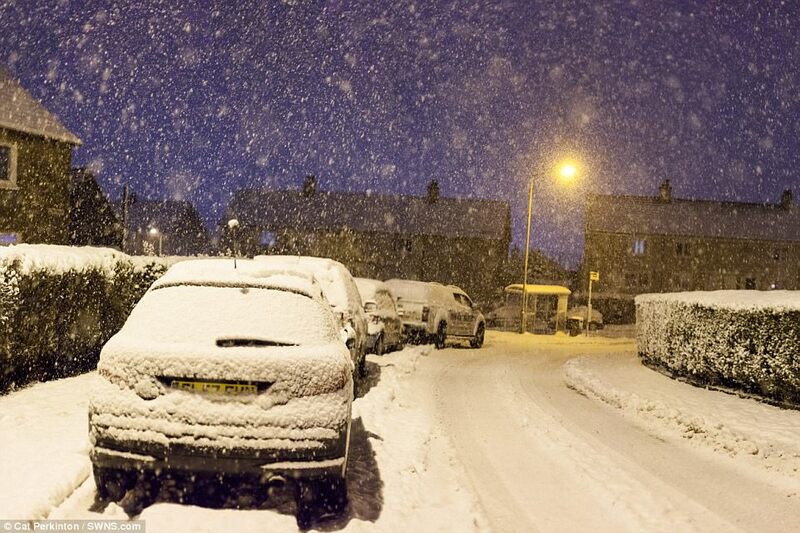 Dozens of schools have been closed in parts of Scotland, while public transport has been disrupted by the weather. There are also fears some rural communities are at risk of becoming cut off and left without power. 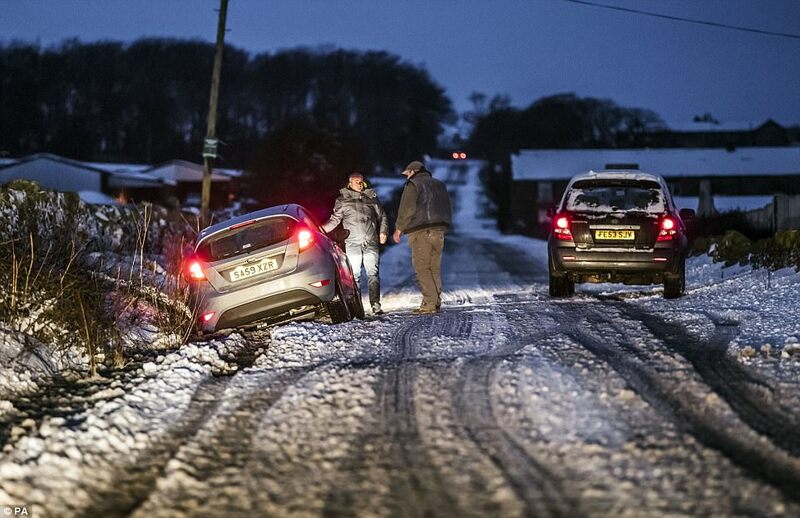 commuters across Britain were warned of treacherous conditions following the arrival of Storm Fionn over Ireland. 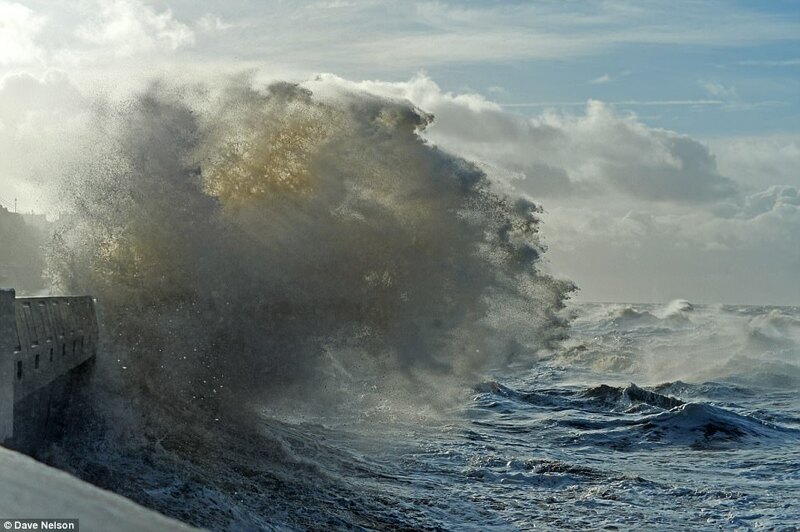 Fionn became the sixth named storm of the season on Tuesday night after smashing Ireland and causing disruption to parts of the UK. Police are also warning against any travel after a weather warning was upgraded to severe. 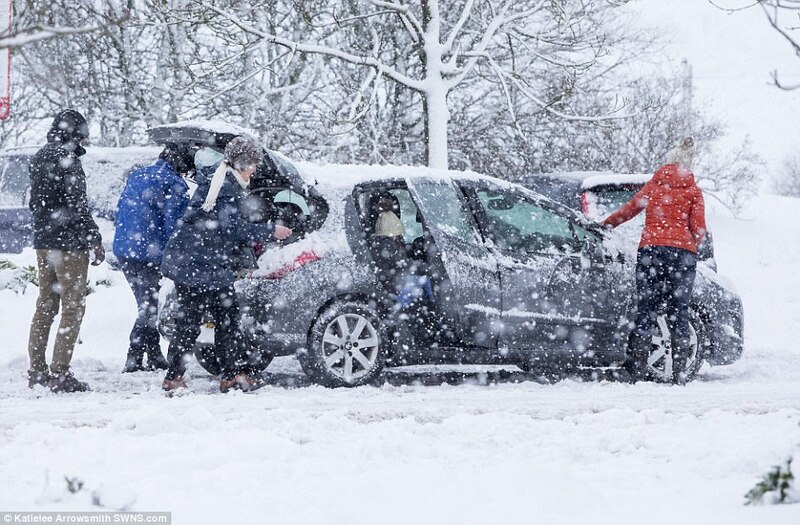 A Met Office forecaster told MailOnline: 'The worst affected areas will be the Scotland - England border. 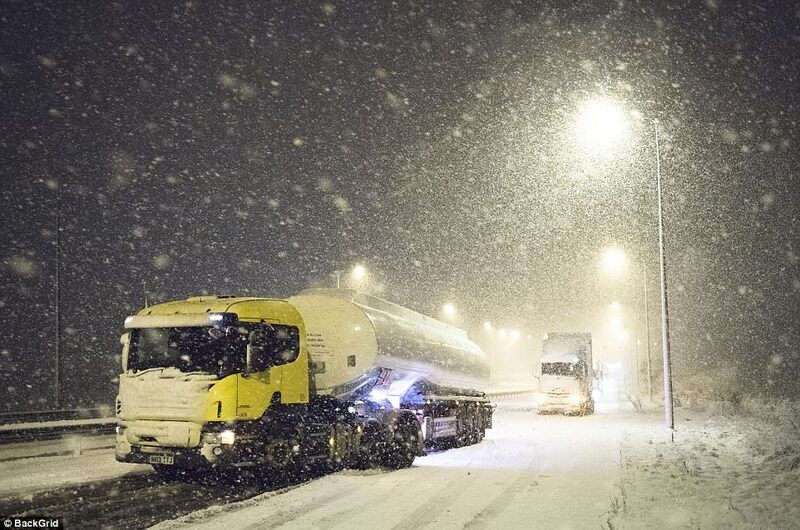 Scotland's transport minister Humza Yousaf told MSPs at Holyrood that following a new Met Office amber warning for Wednesday evening, Police Scotland were upgrading their travel warning from stage three to a stage four. 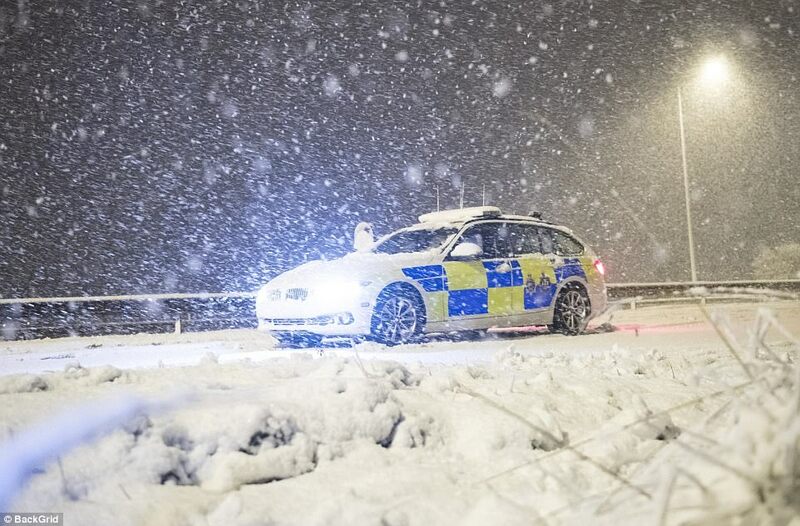 Police Scotland closed parts of the M74 in Lanarkshire in both directions due to wintry conditions for a number of hours overnight. The road later reopened. 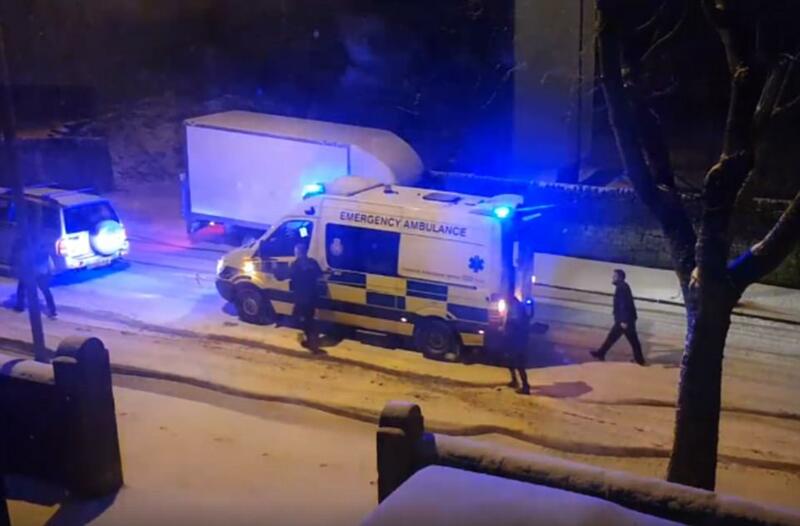 Elsewhere a runaway lorry slid down a snowy street then crashed into a fence on Tuesday morning in Glenmavis, North Lanarkshire. Witness Niki Blackhall, who filmed the incident, said: 'The men in the truck got out to help the crashed cars and the truck slid away. 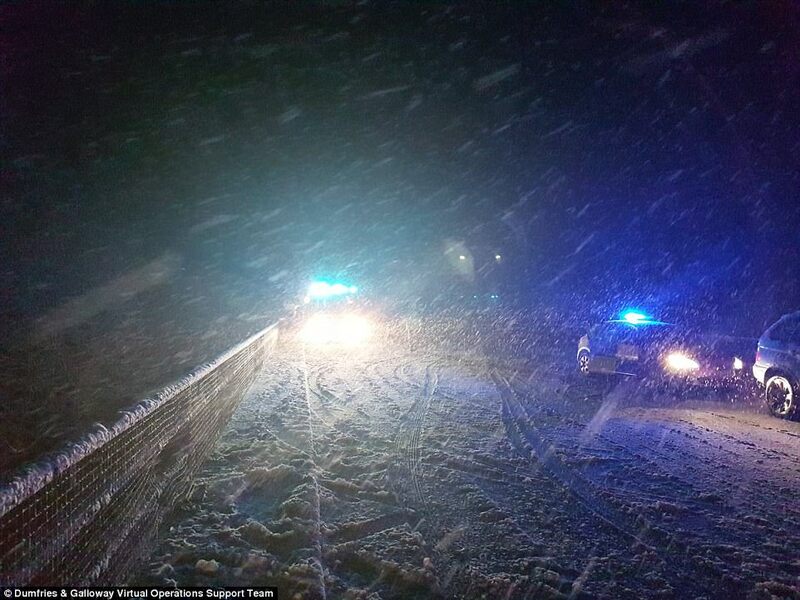 Mountain rescue teams were drafted in to check on drivers on the M74 overnight, many of whom were stuck in their vehicles for several hours. 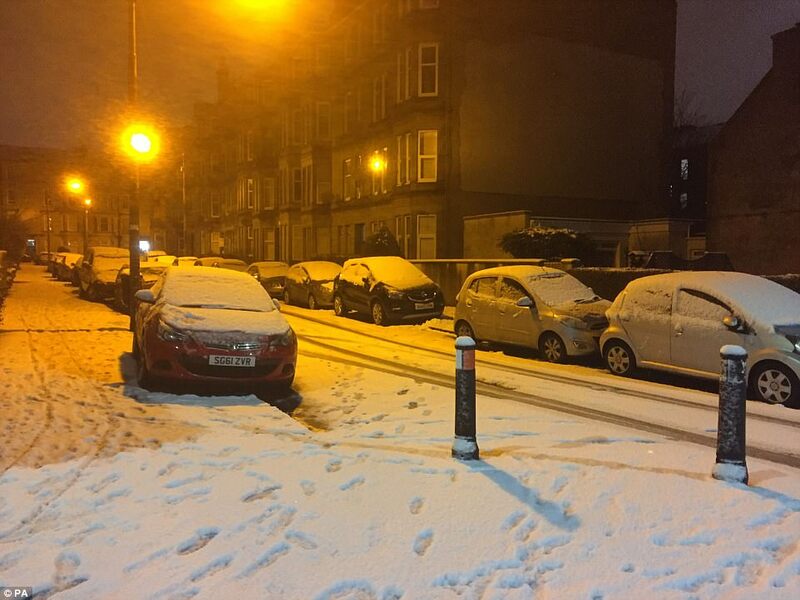 Transport Minister Humza Yousaf has apologised to those stranded in their vehicles overnight. 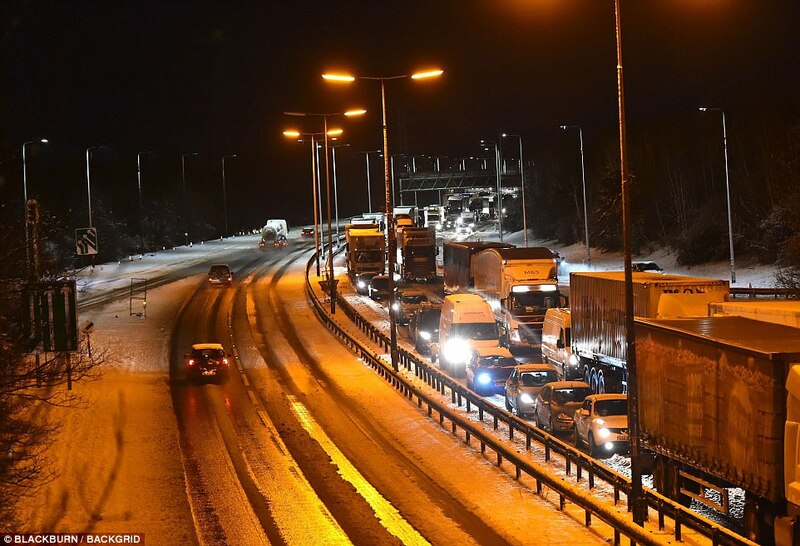 Sam Sykes, a surveyor from Biggar, South Lanarkshire, said he was stuck on the M74 for around 12 hours - from 6pm on Tuesday until around 5.30am on Wednesday. The 25-year-old was travelling from Dalry in Ayrshire to Biggar after work. Mat Jackson, 29, a product manager with Siemens, arrived home in Manchester at around 11.30am on Wednesday - having left Glasgow at 3.20pm on Tuesday. Police declared a critical incident and said that more than 200 people were stranded. 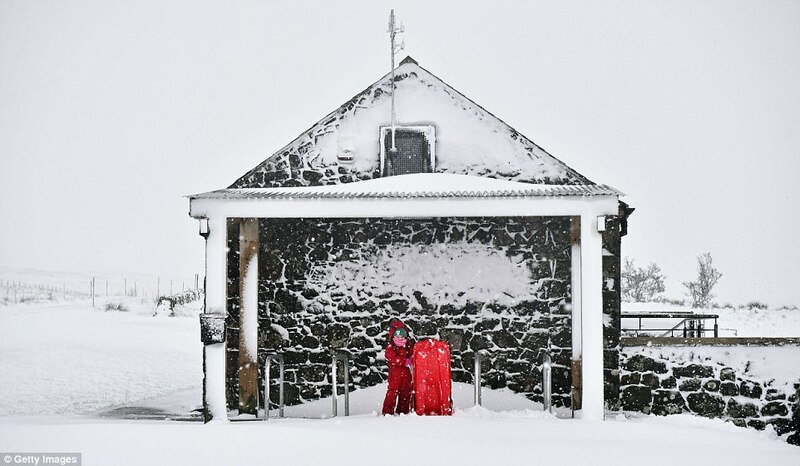 All schools in the Borders were closed due to the weather while 16 secondary schools, 58 primaries and 44 nurseries in the Highlands were shut. All prelim exams scheduled to take place in North Lanarkshire secondary schools on Thursday have also been postponed. Public Health England issued cold weather alerts and health warnings in light of the cold weather, urging people to take extra care. 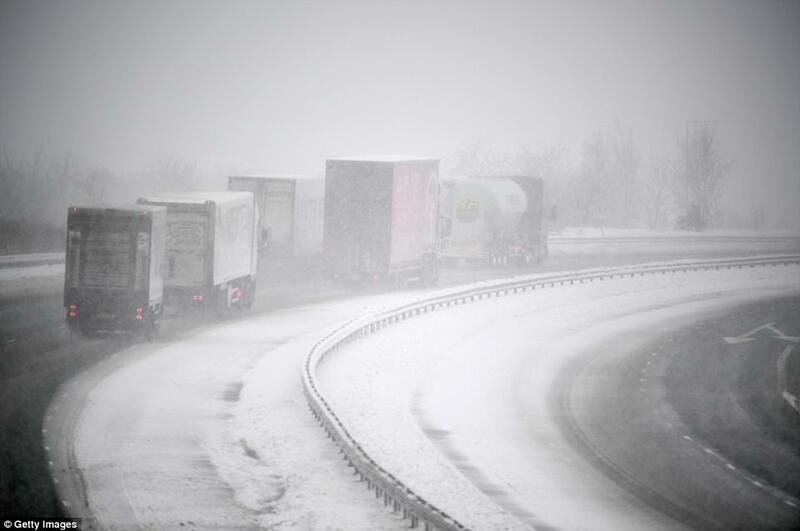 The Met Office amber warning advises that travel disruption is likely, with a risk that some vehicles may be stranded. The warning, which runs from 9pm on Wednesday until 5am on Thursday, says that 3-8cm of fresh snow is likely to accumulate widely, with up to 20cm over high ground. 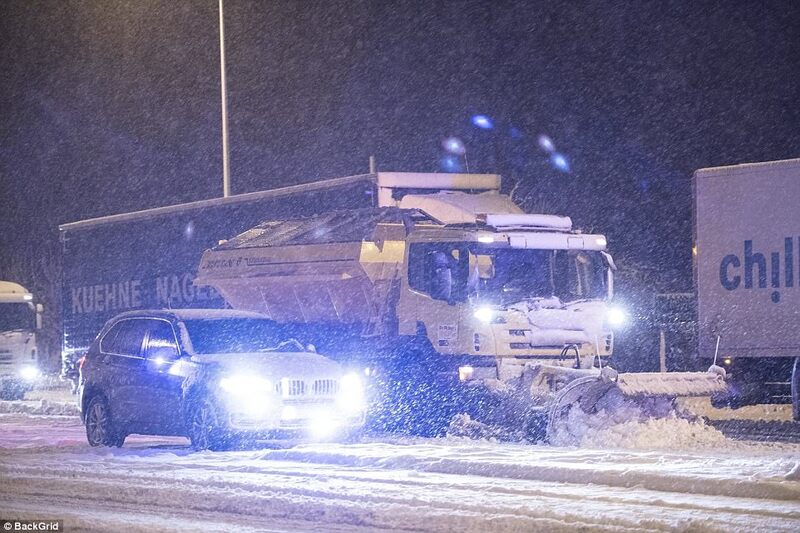 Yellow 'be aware' warnings of snow and ice for much of the country are valid until Friday.